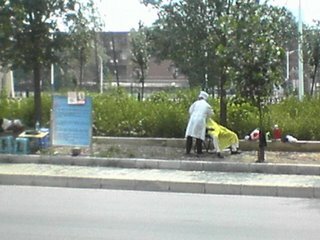 Last week I was going to lunch with a few friends when I saw this guy giving haircuts and a shave on the side of the road. They have all kinds of merchants on the sidewalks selling all kinds of things, so why not a street barber? Not a whole lot is going on besides work. I have been putting together an itenerary for my parents' trip out here to China. Right now it looks like we'll be going to Beijing, Xi'an, ChengDu, and then to Dalian. I will post more about the trip when I have everything arranged. I heard they blew up the old Woodrow Wilson Bridge back home. I can find some video of it on the web, but I would have liked to have seen that in person. I really hated the commute across that bridge. you can eat faster with chopsticks than with a fork. you have to think how to use a knife and fork. you remember your last trip to Taco Bell fondly. you eat at McDonalds to put some solid food into your body. you prefer to drink beer from one litre bottles. you think Great Wall Cabernet is not too bad. you get an urge to spit in public. you fiercely haggle a difference of 1 RMB in price (about 12 cents). white people all look the same to you. you don't mind being in a crowd... of a million or more. you believe you are really tall when you are only 5'10". you don't mind when your taxi honks their horn at people as you drive down the sidewalk. someone says, "Look at the foreigner! ", and you look around. you find yourself "getting back to nature" in a park that contains nothing but concrete and a giant statue of some dead commie. open spaces make you uncomfortable. squatting doesn't seem that difficult. you find state-employed staff helpful, knowledgeable, and friendly. you light up a cigarette in the elevator. you give directions to a stranger in Chinese and they understand you. Yesterday I had some friends over for dinner. Since they were nice enough to cook Sichuan food and Indian food for me in the past I thought I would treat them to some Tex-Mex. It took me awhile to narrow down my selection of dishes, but it was finally decided by which ingredients I could not find (limes and cilantro), and the fact that Vanessa (who is from India) did not eat beef. The main entree was Pork and Peppers Fajitas (recipe here), and the sides were Arroz Con Pollo (recipe here) and Refried Beans. It took me a few weeks to find all of the ingredients and the last two (tortillas and jalapenos) I found only the day before. Everyone seemed to like the food, and since they were from places that usually ate spicy food they liked the jalapenos too. I had also bought some corn bread, peaches and ice cream for dessert, but everyone was too full for dessert. After dinner we watched the movie Practical Magic on DVD. Everyone knew who Sandra Bullock and Nicole Kidman were, but none of them had seen this movie. Everone enjoyed the movie very much. After the movie was over it was kind of late, so everyone went home. I spent the rest of the evening tidying up a little and enjoyed a few Coronas. The weather has actually been pleasant here since my last post where I mentioned our hot summer, so our hot weather only lasted about a week or so this year. I wonder if I'll jinx us by saying that. Talk about jinxing myself... I just realized that my blog is no longer blocked by the Chinese goverment. What's up with that? I'm confused. Is Hollywood really changing? That's different. Feeling confused about the important questions in life? Maybe you'll find answers to The 25 Most Important Questions in the History of the Universe handy! The weather in Dalian is usually pretty cool during the summer, but we seem to have a few weeks of hot weather every year. The weather started getting hot a week or so ago, and hopefully it will not last much longer. Today is not too bad since it rained during the night, but it is very humid. I am still trying to get my air-conditioner in my apartment fixed. I was told that they would come and fix it on Saturday... after I mentioned to the real estate agent that rented me the apartment that I was thinking of getting a lawyer involved. Two people from the building maintenance showed up, looked it over, talked about it for a few minutes, and then left. Today I heard from the owner and he will probably sue the building maintenance company. This was pretty smart of him, since now I won't sue him if he does that. Oh, before I forget... I also mentioned in a previous post that I had my hard drive wiped on my laptop, which means I lost my personal email address book (again), so if you have not sent me an email in awhile I might not have your email address and you might want to send me an email (EDIT: You might not want to leave your email address in a comment). DALIAN, China Tucked away in the back of this coastal city's export-oriented manufacturing zone is a place that can only be described as a modern mummification factory. Inside a series of unmarked buildings, hundreds of Chinese workers, some seated in assembly line formations, are cleaning, cutting, dissecting, preserving and re-engineering human corpses, preparing them for the international museum exhibition market. You can read the entire article here. It is much stranger than the story about beating dogs to death which can be found here. Last week's work week was pretty busy, so when I finally finished work on Friday I went home and just wanted to relax and do nothing. After dinner though I got a call from my boss and he wanted me to come join him and some others at the Beer Festival going on here, so I went over there and had a few beers with them. The festival started to wind down at around 11:00pm, and everyone wanted to continue to party, so we all went to a karaoke place nearby. After about an hour there I left since I was pretty tired. Anyways, after we got the food we needed we went back to my place and cooked up some spaghetti sauce and noodles. For the sauce we used ground beef, onion, green bell pepper, mushrooms, garlic, and diced tomatoes. Salad was lettuce, chopped carrot, chopped broccoli, and ranch dressing. Phyllis liked the spaghetti, but did not care much for the ranch dressing... I guess that's why they don't sell a lot of it here. After dinner we went to the Beer Festival, and the first place we went to was the German beer hall which was run by Paulaner Brewhouse and they had a German band called Take Five. The crowd here was much rowdier than the other places at the beer festival that I had been to, and it was a lot of fun. After spending awhile in the German place we went to try another place to see what other entertainment there was. We went to a place that sold Pearl River beer and watched some shows there until the festival was getting ready to close for the night. On Sunday I went to a beach here in Dalian with some co-workers. We hung out and grilled kabobs and such, and spent some time chatting. After awhile some of the ladies wanted to play cards and after watching them play a game that I do not know how to play I went home. It was getting a bit warm and I was a little tired from going the beer festival two nights in a row. Later that day I had dinner with a friend at Brandos pizza, and spent the rest of the day just being lazy and relaxing.